When Chattanooga’s Innovation District was formed in January 2015 we anticipated companies and entrepreneurs collaborating, forming new business ideas, attracting talent to the district and encouraging growth of an even broader support ecosystem. And despite the difficulties in measuring the metrics of an Innovation District, we have seen all that, and more. This validation has refocused our efforts on impact within the District, specifically through the Framework Plan released in March 2018. During this process we heard the desire for more festivals and events that combine and showcase the district’s innovation, entrepreneurship, technology and creative assets. In response, we are celebrating a full month of summits and conferences in October here in the heart of the Innovation District. This is incredible validation for our Innovation District as world-class speakers will be arriving here in Chattanooga to speak on topics ranging from INNOVATION, SOCIAL MEDIA, ESPORTS, DESIGN, ENTREPRENEURSHIP, and SOFTWARE. This kind of talent confirms what we have suspected for a while: that our Innovation District is equipping local talent and engaging a larger national audience about the collaboration and entrepreneurship happening here in Chattanooga. This full month of activities will bring innovation and talent from around the nation to gather with local companies and talent providing invaluable inspiration, connection and skills in our backyard. 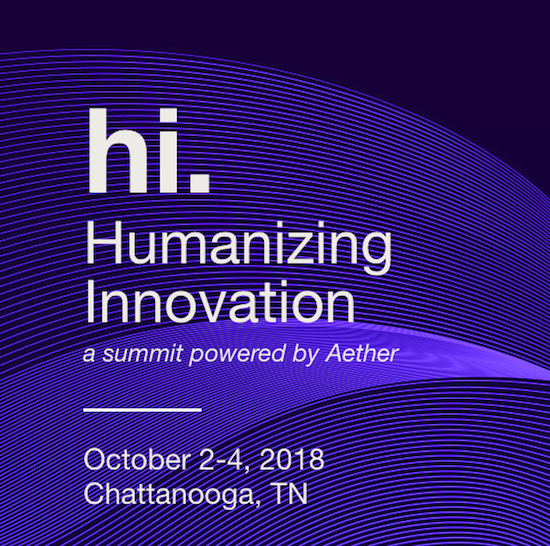 Aether will present a unique un-conference that combines knowledge transfer, skill building, storytelling and networking. The summit focuses on ways that companies, organizations and individuals are humanizing innovation to drive positive change and sustainable growth. You will learn how to create, contribute and connect the atoms, pixels, currency and heartbeats required for the ever-evolving experience economy. The summit is designed to provide actionable next steps to generate a measurable impact for your organization. You will be introduced to others through meaningful discussions, take part in collaborative experiences facilitated by thought leaders, be inspired by the next generation of activists, designers, business leaders and technologists, all while experiencing the best food, music and culture the region has to offer. 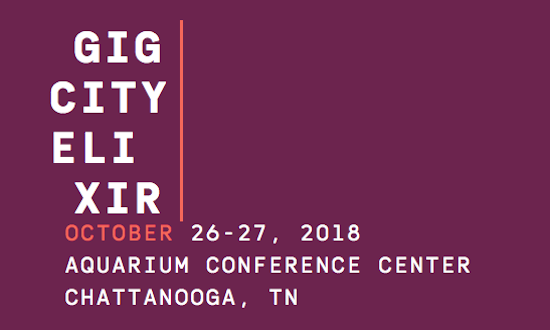 Oak Ridge National Laboratory invites you to the Smoky Mountains Mobility Conference to connect with international thought leaders from diverse disciplines across industry, universities, national laboratories, and the government to drive the conversation on accelerating a more efficient, safe, and secure mobility future. This invitation-only event will be limited to 100 attendees to ensure a collaborative and personal atmosphere. A SUMMIT FOR REAL-TIME SOCIAL MEDIA LEADERS The Real Time Summit is a first-of-its-kind gathering of industry leaders in news, sports, weather, travel, entertainment, retail and more. If you produce real-time content or if you engage customers in real-time, this event is for you! 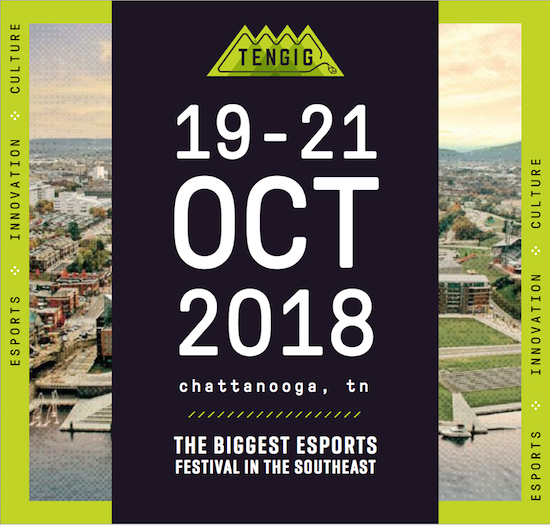 As the biggest Esports Festival in the southeast, TenGig Festival is where esports, innovation and culture converge. TenGig Festival is a brand-new gaming & esports festival dedicated to celebrating esports, innovation and culture. With a variety of events from celebrity speakers to gaming pubcrawls to live tournaments, we hope to create a welcoming environment that bring together gamers of all backgrounds for one massive, esports celebration! 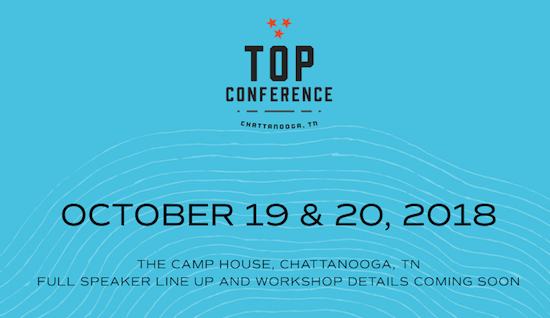 TopCon is is an annual, one-day conference celebrating all things creative. Every year hundreds of incredible minds come together to share stories and ideas, failures and successes and a whole lotta love. TopCon has a terrific roster of talented creatives and professionals to create a jam-packed day of inspiration! Hear and learn from some of today’s emerging, influential and downright nicest people in the creative industry. Maker Faire is a gathering of fascinating, curious people who enjoy learning and who love sharing what they can do. From engineers to artists to scientists to crafters, Maker Faire is a venue for these “makers” to show hobbies, experiments, projects and more. We call it the Greatest Show (& Tell) on Earth - a family-friendly showcase of invention, creativity and resourcefulness. Glimpse the future and get inspired! Startup Week Chattanooga is a celebration of Chattanooga’s entrepreneurial community. This multi-day experience will feature a number of community-led events that highlight our growing startup scene and inspire entrepreneurial thinking. Participants include some of the most amazing startup founders, thought leaders, community supporters, investors and technologists in town, all of whom make Chattanooga an incredible place to live, work and play. We want to showcase the very best of Chattanooga – its can-do attitude, its innovative spirit and above all its people. The software industry has about as many libraries and projects to help you get things done as it does programmers. Lots of conferences focus on those. That’s a fine approach. GigCity Elixir doesn’t. In a world making a slow transition between object-oriented and functional paradigms, our conference is packed with experienced developers and industry leaders who have been active voices for both. They are there to do one thing: make you a better programmer by focusing on the foundational skills you’ll take with you no matter the tech stack.So whether seasoned software engineer or Johnny-come-lately there’s a lot of something for everyone. No matter your interests, experience, or status, this jam-packed October has something for everyone. New ideas and new friends await in the heart of the Innovation District. Come out and work, live and play with us – we look forward to seeing you all in October!